I have to admit, despite having spent every spare moment on this for the past six weeks, I think planning this part has been one of most enjoyable things I have ever done. I used to scrapbook all the time, but I just don’t have the time to keep up on it with the volume of picture I am taking. So I got to get my creativity flowing again for the first time in a year. Most of the stuff I made on my own, but in reality most of the conceptual stuff was taken from et.sy. I struggle with conceptual creativity sometimes, but I am great at the execution, which is completely fun!! The internet is my best friend. 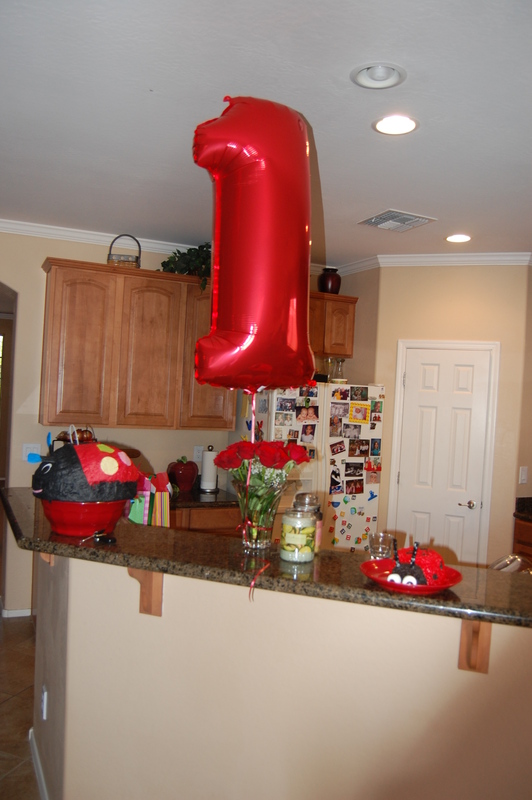 I ordered the balloons, plate and napkins online. 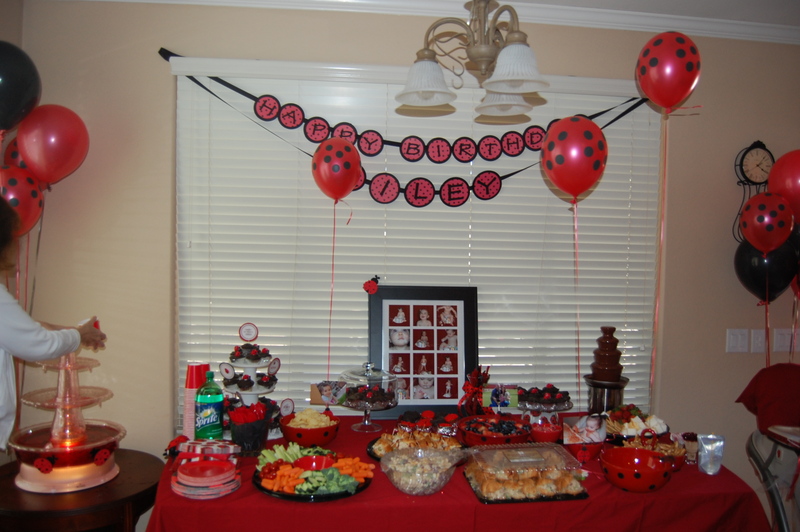 I glued black felt circles on my bowls, made the banner and cupcake decorations and made party toothpick with ladybugs on them! I wish I had gotten better pictures of the details, because I got lots of compliments on my attention to detail. We had red and black mnms, red and black licorice, red and black fruit salad, macaroni salad, chicken salad sandwiches and fresh veggies. My little lady’s throne. I made all the stuff here, too. I baked this smash cake for R and arranged it and my wonderful sister spent two hours decorating. 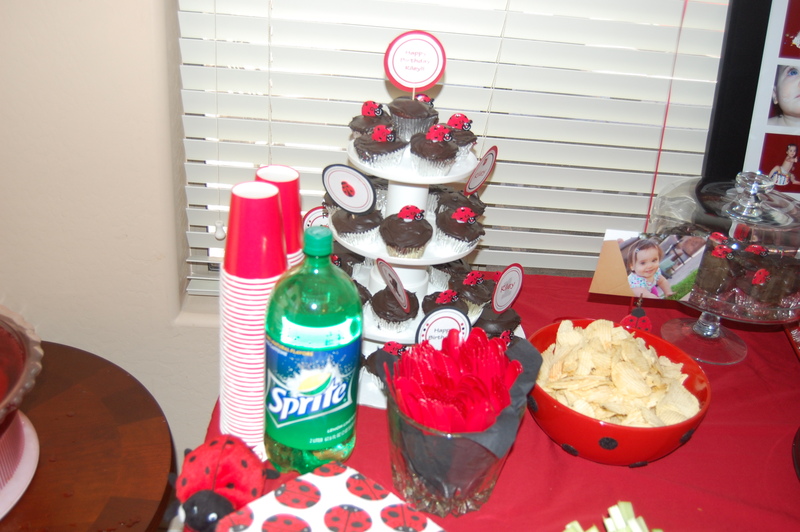 She did a great job especially since the party started and we hadn’t given him any eyes!! 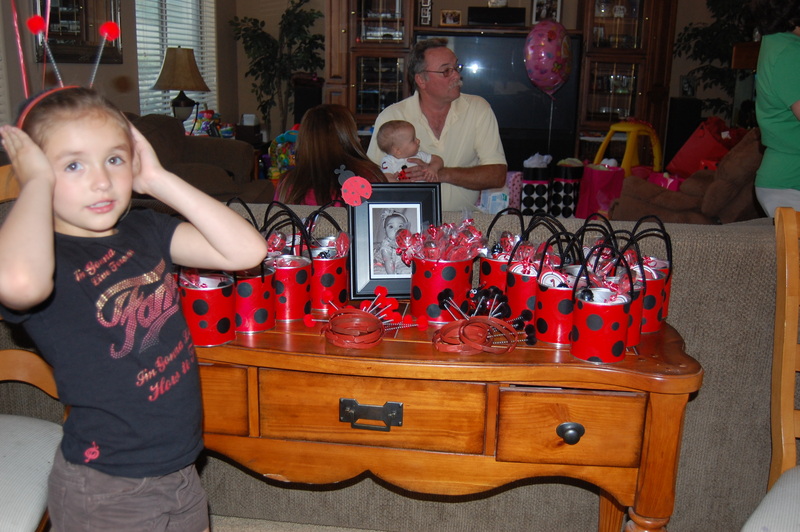 I made favor buckets for the kids using small formula cans spray painted red with black spots glued on. 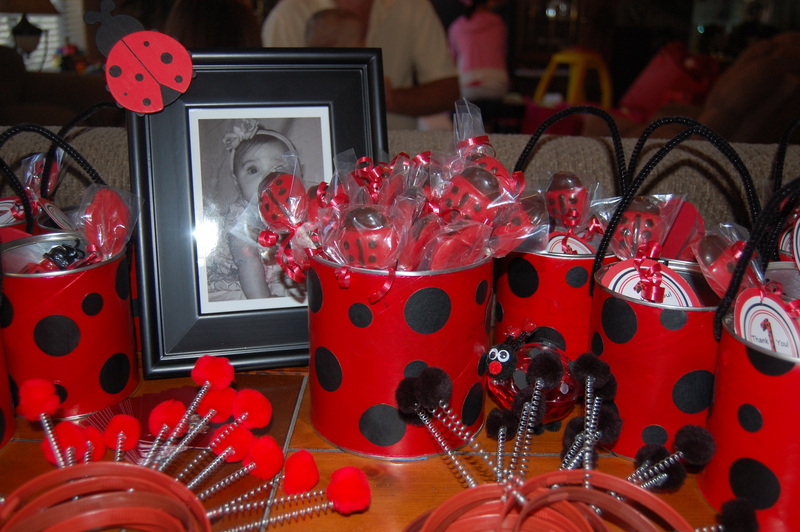 Inside is ladybug bubbles and the chocolate ladybug lollipops. They were all a big hit!! 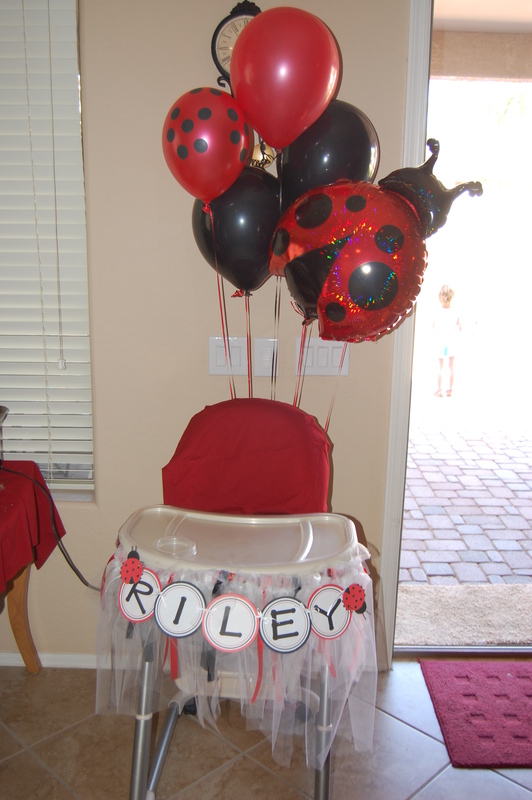 I also made ladybug antennae for the kiddos using some discount stuff from valentines day at ori.entaltra.ding.com. You can also see the lollies better here. 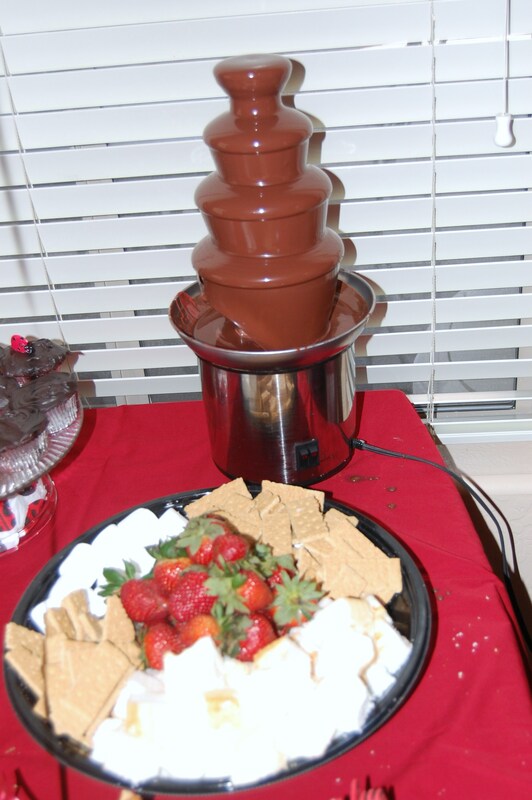 Yummy chocolate fountain (my mom got it at a yard sale last week) that was a BIG hit. The pinata. 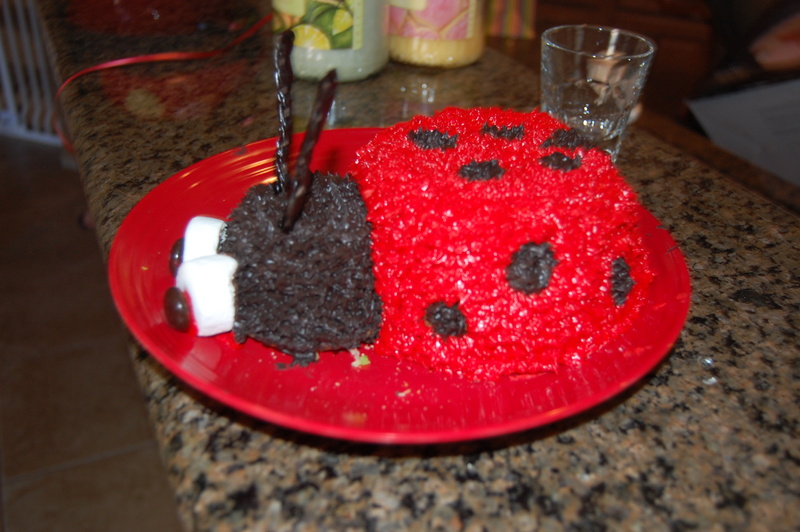 It is sitting on top of a bowl of candy for the bigger kids. The pinata is full of baby snacks. The best part, of course, are the pics of my baby girl. You’ll have to check back for those! Love the smash cake! Such a great party! Cute theme! you did a super job! you are the party planner extraordinaire! how darn fun was all of that for you to do, and for everyone to experience?! LOVE all the decorations, you did an amazing job!! So spill it, where did you order all the balloons, etc. from?? I cannot wait to see the pictures of R…that will definitely be the icing on the cake, so to speak! I made C’s birthday cards today and am starting to switch into high gear in terms of planning. SO EXCITING!! Happy Birthday again, Baby Girl…WOW! ebay ebay ebay. Most of the stuff I made, but a lot of it was from ebay or just by googling stuff. Thanks for the compliments! Wow, what an awesome party, looks like so much fun!!! You did a great job with everything thing!!! I am planning planning planning right now…its a good thing I am not working because this is really time consuming to do everything but its so much fun!!! I love to shop online…and I always get the Oriental TC cataglog also…maybe someday I’ll get to put it to good use!